There's 40 comments so far. Last comment was posted 1 day, 1 hour ago. I have had quite the love and hate relationship with the Pearl Diver’s Punch this week. 100% of the hate comes from making it and 100% of the love comes from drinking it. This drink, simply put, is the Thomas Keller of exotic cocktails. For those of you not familiar with the joys of the French Laundry, imagine a recipe that contains 20 ingredients and takes two hours to make. In Kellerian World, this isn’t the big deal, however. Take 3 – 7 of those ingredients, and make them recipes in their own right, each taking 1 – 3 hours to make. If your one-bite amuse bouche hasn’t taken 15 hours to create, it’s obviously not successful. Enter the Pearl Diver’s Punch. Butter separation. Nothing is more foul than a greasy film of milk solids sitting in a hazy pool on the top of your drink. My attempts to make this drink over the past few days have resulting in a bit of a revelation. The difference between the happy, buttery bubbles you see above and a greasy-sea of separated milk solids is very small. And it involves a lot of failure. Room temperature butter added to honey. Creamed. The milk solids oozed out of the butter in the foulest of ways possible. Why? I didn’t cream the butter first. Failure #2 – But I thought it would be a success! Failure #1 but with creaming the butter first. I added the remaining ingredients to the Pearl Diver’s Mix and ended up with a damn tasty mixture that resembled molasses mayonnaise. I added the mix to the blender with the remaining ingredients and it turned into a bog of white goo. If you’ve ever left a braised stew in the refrigerator overnight to develop more flavor, you know what this looks like. A thick layer of white fat, separated from the lusty broth below. Not so good in a cocktail. A quick test revealed that it was the citrus juice that was causing the separation. I threw one of the separated batches of Pearl Diver’s Mix into the microwave to melt. A syrupy goo resulted with no separation. I popped it in the freezer for 10 minutes. A fine congealed solution resulted, though not as appealing as my previous endeavors. I blended with the remaining ingredients for the drink and achieved success! Bubbly goodness on the top and no separation. Thinking this was indeed the method, I tried again. This time, the milk solids separated and formed a thick layer on the top while freezing. The final blended result did not make me happy. In reality, this is more like failure #10, but I’m saving you my anger and Cook’s Illustrated-like tests. I decided to microwave the whole load, as many other tiki drinks call for, heating up the honey until liquid. This seemed to work! I put everything in the blender and whizzed it up. Separation ensued, though not as bad as before. I can only attribute this to the following: I left the mix too long on the counter to cool down or I didn’t properly pre-mix certain ingredients: see below. The microwave gave me a hint. All other tiki recipes had melted honey, why didn’t this one? I followed “the process” below and ended up with a foamy pleasure ride of butter and glory. If you follow the coming steps exactly, there is a slight chance that your own result will be quite as pleasing. This is the only method that I have achieved success with two times in a row. Melt room temperature unsalted butter in a pan or microwave. Add honey and melt for a few seconds longer. Stir together. Add pimento dram, cinnamon syrup, and vanilla syrup, all at room temperature, and stir. You should have a golden, smooth, and liquidy mixture that tastes like Thanksgiving dessert. Add 3/4oz Pearl Diver’s Mix to blender. Add orange juice and lime juice to blender and mix on low for 5 or so seconds. Add remaining ingredients, including ice, and blend for exactly 20 seconds. You shouldn’t need to strain anything, as the butter hasn’t separated. Pour into a glass where the neck is no wider than the base, and you should get fun bubbles and the creamiest of textures. Each sip brings hints of vanilla, clove, cinnamon, but none overpowers the others. The three rums offer rich and floral tones to augment the mellow orange flavor in every sip. The butter and honey offer a delicate texture not too unlike cocktails that contain egg. Thank you Gwen over at Intoxicated Zodiac for hosting Mixology Monday. I hadn’t seen your blog before, but I’m glad to have now! Your photography is fun; I especially like the garnish of 8 blueberries and a seashell. Why is Kaiser Penguin an Idiot? Please chime in and tell me why I have completly ignored sane thinking or perhaps forgotten some magic process to make the Pearl Diver’s Mix. (Jeff? … hello?) You know, when it comes down to it, I’m quite disappointed that Berry didn’t include the most important ingredient in the Pearl Diver’s Punch. Pray to the great god Uddermumous, the bringer of smooth butter and fine drinks. The fine glass you see above in the picture was sent to me by Derek from Cocktail Vibe in an enormous box filled with tons of very fun and swanky glasses. You’ll most likely see lots of them in upcoming shots, because to be honest, they are pretty darn cool. I’ve only broken one, and the stem at that, but that was entirely my fault for rocketing it out of the freezer onto our hardwood floor. And finally, something else to comment on. Totally awesome. The comparison to Keller is dead on. A couple of thoughts on the ingredients. You might try using Indian ghee rather than butter, which is basically the lipid part of the butter without the milk solids, boiled down. You could also melt the butter and strain the solids out. The second thing is to add an emulsifying agent to the butter to keep the fats from congealing at drink temp. In Alton Brown’s Buttermilk Pancake recipe, you mix the melted butter and egg yolk together before adding the rest of the ingredients. So, a bit of egg yolk mixed into the butter might work, and you’d have to be careful and temper the egg yolk so it doesn’t scramble. I’d try whipping this together really well, then whipping in the spirits to get everything really mixed up, then blending with the acids. And, yes, butter in a cocktail weirds me out. And no, butter in my booze doesn’t freak me out. Once we move into the realm of cream-cheese cocktails, though, I’m turning back. I second a lot of what Phil says, with a few alternatives. Rather than hunting down some ghee, you could just try drawn, or clarified, butter. You make it like this: http://www.cookingforengineers.com/article/131/Clarified-Butter. It is easy to do, yet adds further to the byzantine, Kellerian nature of the Hajj that is the making this drink! And you could try egg white instead of yolk. Less emulsification, but less new flavors too. However, I’d try the drawn butter first, without the egg. A final adjustment should be made. Uddermumous requires more than simple prayer. You must spill a small quantity of whole milk on the ground outside your east-facing back door at precisely 2:37AM on the night of the previous New Moon, accompanied by ear-splitting, neighbor-wakening utterance of said prayer. If you don’t have an east-facing back door, you must either add one, or rotate your domicile in its entirety. Please take another week out of your life to try all the suggestions you get in the comments here! I for one want to hear about how it comes out, since I cannot foresee a day when I have enough time or low enough blood pressure to try this myself! That said, I WANT one of these drinks! Thank you for trying this before I had to! I too have fallen prey to the citrus + dairy fat = separation dilemma. I can’t quite recall what I was making, but it wasn’t pretty. Sorry this one’s giving you so much trouble! It shouldn’t take more than 10 minutes from start to finish: You shouldn’t have to heat or freeze the mix as long as A) the room-temp mix is thoroughly whipped together, B) you blend the drink at high speed for at least 15 to 20 seconds, and C) you strain the drink into your glass through a fine-mesh wire sieve, which will keep the solids out of your drink. Phil’s idea about using ghee is pretty interesting though — I’m definitely trying that! Phil, Great ideas. Do you think the flavor that the milk solids provide (when not separated) is important enough not to separate them ahead of time? Paul, I hope the Pearl Diver’s Punch didn’t come across as a foul libation! In fact, when made properly, it is easily one of my favorite exotic cocktails. Doug, I knew there had to be an intense “recipe” of a prayer for the Pearl Diver to work out! I’m pretty happy with the method of just melting the mix and then adding it warm to the blender. It has been successful and the butter doesn’t separate. Jeff, A and B are go. C is the icky part. Are you saying it’s ok if the butter separates and you strain it out? This is so far out of the realm of my abilities. I’m trying it tomorrow! Great work, and no, butter and cream cheese don’t freak me out. Chicken stock, though, does. To keep the butter and other stuff from separating you might want to try a little chemistry trick and add lecithin to emulsify the batter prior to mixing. That’s what the honey, and other sugar based syrups, are doing in the recipe. If you are worried about flavour it kind of tastes slightly buttery and nutty, with a light flavor that is reminiscent of apple. It is used in a lot of food products. You can get it at your local health food store. Jeffrey, you’re afraid of chicken stock? It goes good in a Caesar (Bloody Mary) but Beef Bullion works better. Darcy beat me to it, but it’s the lecithin in the egg yolk that emulsifies the butter. Egg white doesn’t have a meaningful amount (if any). Doug is right, it’s easy to clarify it yourself. But, you need to get a cow and a butter churn to make it properly Keller-ian. I don’t think the milk solids are adding much flavor, particularly considering the pimento dram in there. One thing I am concerned with in removing the milk solids entirely is that the proteins in them may be what’s enabling the foam. If that’s so, ghee/clarified butter wouldn’t foam much. 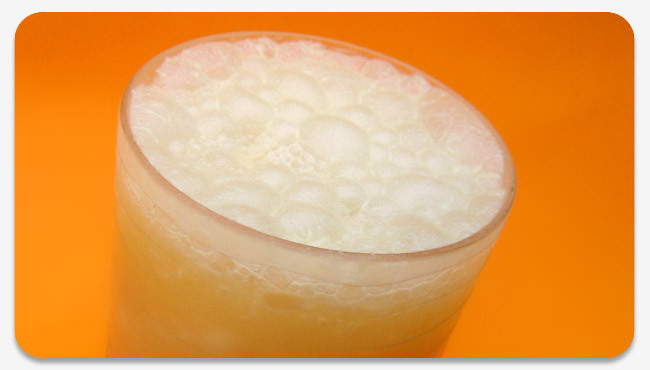 Maybe a bit of egg white would create the foam without denaturing as easily as the milk solids? I’ll have to do some research in McGee. Drinking my own mix of this now. Very nice, but I didn’t get those lovely bubbles. A few sad suds, but nothing extraordinary. Still, quite delicious with a really nice intangible quality to it. I was hoping for a thicker texture, but the subtlety of the creamed butter is very pleasing. Of course, now that the butter’s all mixed up, it’s time for Hot Coffee Grog tonight! Jeffrey, I’m eager to hear your thoughts and struggles with this fine drink. Darcy, I’m quite inclined to give lecithin a try. My interest is piqued. I wonder if the final result will be much different when the mayo-like butter mixture doesn’t separate vs. the melted variety. Beachbum, Is it pretty consistent with other exotics for the solids to separate? It seems to me keeping everything emulsified results in a silkier drink. More tests are in order! Phil, Your research is much appreciated. Please report back any findings. Blair, The drink is definitely not a thick one like you imagine. It’s more of a velvety concoction. Were you able to make it without the milk solids separating? If so and you still don’t get awesome bubbles, try using a smaller glass with straight sides. I noticed when I put it into a wide-rimmed glass, it didn’t bubble as well. I’m sure Darcy can speak with expert knowledge to this phenomenon. In my experience, lecithin adds more body the longer it sits after it is mixed with liquid. It’ll add a moderate amount five minutes in, and significantly more after sitting in the fridge overnight—just a little warning in case you make anything ahead of time! Your dedication to the tiki cause is an inspiration to me. Wow, I wouldn’t have made it past the first failed attempt. TOKYO — When Koji Nakamura mixes up a margarita cocktail, he adds a special ingredient – mayonnaise. “Mayogarita,” a white drink with a hint of the creamy dressing, is one of several cocktails Mr. Nakamura serves in his Mayonnaise Kitchen restaurant in suburban Tokyo, which features mayonnaise with everything from toast to spaghetti to fondue. Mr. Nakamura’s tiny restaurant, which has fewer than a dozen tables and is decorated with cutouts shaped like mayonnaise bottles, also offers a drink called the Mayoty Dog, which tastes like the vodka-based cocktail Salty Dog but is served in a glass with mayonnaise on its rim instead of salt. Okay, hold on. You had me at Mayorita, I’d actually like to try whipping one of those up to see if a) I can do it, and b) if it’s not actually terrible. But the gooey wet mayonnaise rim is taking it too far. Try Wasabi Mayonnaise for a spicy kick! Or Helmans for your southern-style Bloody, Lumpy Mary. Rick needs to do this, and take the pretty pics of the glop-a-licious rim. I think we’ve got a new Mixology Monday theme! Dear god, I hope it is egg emulsified cocktails, not mayonnaise! Coffee Cocktail and Bass Wyatt both rock. Sorry, I meant the theme for the MxMo being emulsified eggs, not the restaurant drinks. I have to admit I have an evil plan for a cocktail, should emulsified eggs actually be an upcoming theme. Savory-ingredient cocktails wouldn’t be a bad theme: my own lamb martini, I’ve heard of a bacon one before, Golden/Silver Fizzes, Alamagoozulum, Ramos Fizz, Pisco Fizz… what else? Clamato Martini? How about applewood smoked bacon infused vodka? 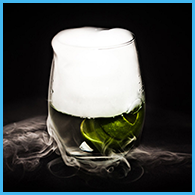 Like the Dreamy D. Smoking/ed Martini in Joy of Mixology, only meatier. Like the yin to Rick’s yang (oi but that sounded dirty), I am rather militant in my refusal to add butter or eggs to my cocktails. I find that five seconds in a blender usually foams my tiki enough to create the desired mouthfeel. I have really been enjoying the hell out of my copy of Sippin’ Safari (Rick and have tastings and discussion several times a week), but I admit that the recipes calling for specialty mixes are often skipped over. I enjoy making my own syrups, but when I have to use the stove to make a drink, I feel something has gone terribly wrong. Rick, you are the embodiment of perseverance. My hat is off to you and your relentless pursuit of fine dairy-infused cocktails. The Pearl Diver is such a fantastic drink, if you close your eyes and imagine only the taste, is won’t matter what the butter did or didn’t do. I’ve long given up trying to strain the drink and now that I’ve lost my prejuidice toward butter, the solids only add to the enjoyment. It’s like they say in Thailand, you gotta learn to enjoy eating the eyes! Okay, I just need to say that this drink is the biggest pain to make — I can’t think of a time that I’ve needed to start prep on a cocktail ingredient around 7:00 for a drink I’m mixing at 10:00. Then again, I was starting from scratch (cinnamon syrup, butter mix), plus, I’m slow. But you’re right, this is a damn tasty drink. Like Trader Tiki, I also lacked the big bubbles on top, but the whole “straining the solids through a mesh strainer” part made mixing the drink worthwhile — the caviar-like texture of the gunk in the strainer was really bizarre, and the entertainment value made up a lot for the hassle of mixing it. I really like the texture the butter gives to the drink — the only thing I can compare it to is when I made a gomme syrup using gum arabic, which gives the sugar (and the cocktails you use it in) a really silky texture. This drink has that same kind of luscious mouthfeel, plus it feels a little decadent drinking it. Though, back on the downside, my glass and entire mixing kit are going through the dishwasher tonight–no way I’m scrubbing off the butter by hand. I must put a stop to the stereotype that tiki drinks are a lot of effort! I cannot deny that the creation of syrups, batters, and acquiring 45 kinds of rum is a challenge. But once you’re set up, mixing and slinging exotic cocktails is as easy as … braising lamb shanks for three ho… no! It’s as easy as making a martini. I tried my warm batter method last night, and to my great distress, it separated! I can only guess this is because I “softened” the butter in the microwave since none was out. The mouthfeel is amazingly improved if you can keep the butter from separating. Has anyone gotten it to work? The Nui Nui is on its way on a chariot of pimento dram! 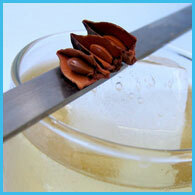 I just made a couple of Pearl Diver Punches. When I made the batter, I found that it did not want to stay together at all. I added a little less than 1/2 tsp of liquid lecithin (suggested earlier somewhere in the responses) to a double batch of the batter mix, and it came out perfect. The drink had a nice froth on top and no straining was required. I’m still sipping my punch. This drink is delicious! I am new to building internet sites and I was wanting to know if having your website title relevant to your content really that crucial? I see your title, “%BLOGTITLE% ” does seem to be spot on with what your website is about yet, I prefer to keep my title less content descriptive and based more around site branding. Would you think this is a good idea or bad idea? Any help would be greatly appreciated.